Retreat: removing oneself from day to day life to focus on something else, usually spiritual or self-discovery. 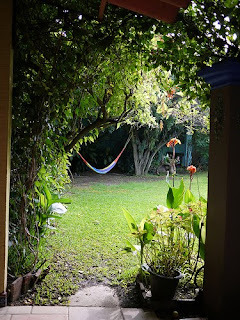 I'm on the tail end of my latest vacation - a Salsa and Yoga Retreat in Oaxaca, Mexico (you can check it out the link to the right -> ) If you're even wondering if its worth it to try - STOP. It IS. In the last 9 days, I've had the pleasure of meeting and getting to now some wonderful people that I hope to stay in touch with and see again. I've been bitten by mosquitoes and other small critters (ay!). I've eaten some amazing food and drank hot chocolate evey night. I've danced with some amazing dancers, worked on my own dancing and helped others with theirs I've returned to Oaxaca to see it lush and green and teeming with beautiful flowers amidst the colorful decorations of Mexican bi-centennial independence. Its my last day here in Mexico and I have one more adventure left - a temezcal spa treatment to "cleanse" me as I get ready to return to "reality". My flickr photo blog will soon be flooded with the many pictures I've taken but before that happens, I thought I'd at least share some highlights from my trip. I realized the bug spray has an expiration ... basically, one needs to spray every 4 hours or so before the bugs work up the courage to come back and bite you again. Dancing is so joyful - I knew this already. I was able to just dive into it everyday, share it with old and new friends alike and watch everyone blossom as they too immersed in the dance. There are so many stories to hear and share with people - even ones that I consider close friends. Time is always well spent when you start to share more and more of yourself, with people you trust and enjoy. Oaxaca is a land of so many wonderful treasures: from the food, to the chocolate (yes, a class of its own), to the people, to the colorful windows and doorways, to the various flora and fauna that are thriving, now that the rains have come. Lying in a hammock under the shade of trees, reading is a wonderful thing...I wish I could put a hammock in my 1 bedroom apartment back in Seattle. Eating out after Salsa dancing is universal! I had my 1st taste of Mexican pizza at 4am on the streets of Oaxaca. Corn covered in mayonnaise, cheese, cayenne pepper and lime juice is AMAZING. Dancing in the crowded floor at La Candela was incredibly casualty free. I am still surprised by how infectious my joy in dancing can be: if everyone danced, this world we live in would be so wonderfully different. Dancing is ageless; you can come to it at any time in your life and still enjoy it as much as if you danced all your life. I wish I could continue, doing yoga for an hour, dancing 2-3 hours of salsa (or some other dance) everyday... despite the humidity and the bugs. I'm lucky though, when I get back home, I'll have the comfort of my bed, no more bugs to contend with, will still have dancing to look forward to (oh yes!) and my family to laugh and hug again. I'll even bring back chocolate from Oaxaca so I can enjoy that for a little bit longer. Almost everyone that came to the retreat has left... its quite and somewhat lonely but I'm happy and content. The 1st trip to Oaxaca transformed my dancing and helped me take it "up a notch". I met one of my best friends on that trip. This 2nd time around is no different. I'm sad to leave this wonderful place but I'm excited for the new friends I've made (we'll see each other again).